Somalisa Camp answers the call of those looking for the ultimate wilderness experience. A perfect combination of old African charm and elegance, this superb camp affords you the romance of pioneer safaris and unparalleled wildlife encounters. Hwange National Park is a land of contrasts from dense teak and acacia forest to vast open savannah, offering guests an exhibition of raw and diverse Africa. Somalisa Camp is a place where tranquillity meets adventure. Where one moment you are sipping on your gin and tonic, listening to the distant baritone roar of a lion coalition off on the hunt, and the next you are gazing over at a congregation of elephants at your doorstep, peacefully sharing a sundowner with you. Every person is part of the community that helps create the magical and welcoming feeling you get when you visit Somalisa, you arrive as a guest, but you leave a part of the family. 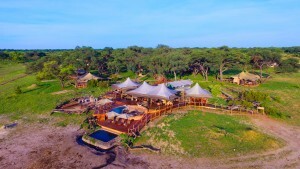 Nature and luxury are in harmony at Somalisa Camp. With natural wood and copper finishes, the organic features of the bush fuse perfectly with the deluxe style. Kudhinda, the Zimbabwean national material, is paired with modern decor creating an authentic contemporary African fusion. At the edge of the expansive deck in the main area, sits an elephant pool which is frequented by elephant families, which is a true highlight at this beautiful camp. Right in the heart of Hwange National Park, in a prime location frequented by many plains game and predator species, Somalisa Camp answers the call of those looking for the ultimate wilderness experience. A perfect combination of old African charm and elegance, this superb camp affords you the romance of pioneer safaris and unparalleled wildlife encounters. You can be sure to witness Africa’s Big 5 while on safari at this Zimbabwe accommodation. At Somalisa Camp, game viewing is conducted on 4X4 vehicles on day and night drives, particularly around the Kennedy Vlei, where an abundant wildlife and vegetation manifest. The area will treat you to some elephant, lion, roan antelope, kudu, white rhino and hyena encounters, among other species and if you happen to visit soon after the first rains, you will feast your eyes on the kaleidoscope of colour from the seasonal wildflowers that blossom during this time of year. Somalisa Camp serenely nestles amongst a grove of acacia trees and offers just 6 large canvas tents that are ideally placed apart with bush between them for privacy. Each tent rests on a teak platform and is equipped with en-suite bathroom, complete with a flush toilet and open air bush shower. The tents are linked to the main areas by wide paths that are lit by paraffin lanterns at night, adding to the romantic allure of the place. In the communal areas, you will find antique colonial décor with a touch of classic African textures and fittings. The lounge provides a warm and inviting place to wind down while the bar is ideal for a sundowner. You may want to take a dip in the swimming pool to escape the scotching sun. Adventure, Birding, Nature, Wildlife, And more.